[Christopher] has put together a Prank Stun Baton to annoy his friends. It delivers a slight shock to the person on the business end of the device. Oddly, it’s powered solely by static electricity, there is no battery here and the resulting injury is no worse than touching a door knob after scooting your socks around on some shag carpet. The design is super simple and is effectively just a rudimentary capacitor. The main housing is a PVC pipe that acts as a dielectric in the ‘cap’ system. Two separate pieces of tin foil are wrapped around the inside and outside of the PVC pipe. These layers of tin foil provide a conductive path up to the a couple of screws stuck in the end of the baton. A ping-pong ball and some foam act as an insulator between the PVC and the screws. To charge the baton it only has to be brought close to a source of static electricity, a tube TV will do the trick. Rubbing it with a piece of wool will also work. When this is done an electrostatic field is stored in the PVC between the two pieces of tin foil, one side takes on a positive charge and the other a negative charge creating an electric potential between the two screws at the end of the baton. When something (with a low-enough resistance) shorts the screws, the stored energy on the positive screw tries to go to the negative screw, shocking the unsuspecting victim. Need something a little more powerful? You may want to check out this other stun baton. 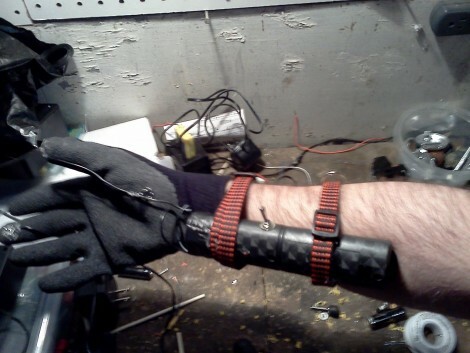 [Jair2k4] ditched the Altoids tins and found a new voltage source for this latest rendition of his taser gloves. Regular readers will remember his first iteration which used wrist-mounted enclosures containing the flash circuitry from disposable cameras to shock the wits out of someone with the laying on of hands. This one is a complete rework but it follows the same concepts. The new shock circuitry is from a bug zapper in the shape of a fly swatter. We’ve seen these handheld devices before and dismissed them as a gimmick, but [Jair2k4] got his hands on a couple of them and found out they can put out a spark of up to 2300 volts. He set to work by getting rid of the tennis-racket-style grid at the top of the handle. He soldered on some contacts which reach to the tip of his middle-finger and thumb on some rubberized work gloves. The original handle was kept as it’s a nice battery holder and works well strapped to his forearm. Does it work? You bet – even singing his arm hair and leaving welts on his skin. See for yourself after the break. And yes, this goes on the list of hacks you should recreate!